Alberta Progressive Leader Alison Redford says all Tory members of a legislature committee that hasn't met in nearly four years will pay back every penny they were paid to serve on the committee. 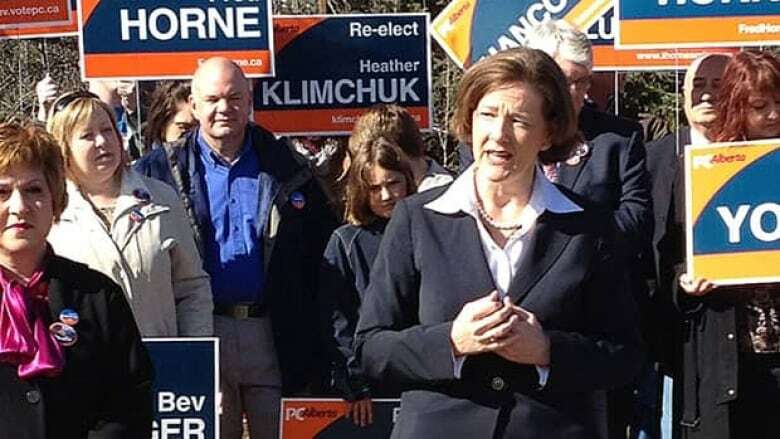 Alberta Progressive Conservative Leader Alison Redford says all Tory members of a legislature committee that hasn't met in nearly four years will pay back every penny they were paid to serve on the committee. Redford admitted she made a mistake in not making them do so sooner. "Leadership is about making decisions; sometimes difficult decisions and sometimes, admitting you were wrong," she said Thursday morning in Edmonton. "My government should have acted faster and gone further than we did over the past weeks." The premier ordered Tory MLAs on the committee that hasn't met since 2008 to pay back all the money they've received — $1,000 a month. Last week, the PC caucus decided that the MLAs would only have to return a maximum of $6,000 — $1,000 for each month Redford has been premier. But the gesture did little to placate Albertans who have been outraged about the committee since the Canadian Taxpayers Federation gave it one of their Teddy Awards for government waste on March 7. "Growing up I was always taught that the only thing worse than making a mistake was not admitting it and fixing it," Redford said. "I made a mistake on these issues and now I am fixing them." Redford's opponents were quick to jump on her mea culpa. "When our MLAs stood up and did the right thing and said they were going to pay the money back, she called it a stunt," Wildrose Party Leader Danielle Smith said. "Well, this is quite clearly a stunt in the middle of a campaign to try to distract attention away from the fact that she didn't make the right decision in the first place." Liberal Leader Raj Sherman, who paid back the $43,000 he received to sit on the committee, was similarly unimpressed. "Premier Redford and the PCs are desperate," he said. "They'll say anything to get elected." Redford's reversal came while speaking with reporters on the campaign trail in Edmonton-Glenora Thursday morning. Earlier in the morning, Smith told the media that committee pay is one of three issues that "comes up again and again" on voter doorsteps. Wildrose and Liberal MLAs on the committee — formally named the standing committee on privileges and elections, standing orders and printing — have already said they will return their committee pay in full, which could amount to as much as $40,000. Alberta NDP Leader Brian Mason stood fast Thursday on his party's refusal to return the money saying committee member Rachel Notley sits on so many other committees without compensation, that it's a wash.
Scott Hennig, the Alberta director of the Canadian Taxpayers' Federation, said the committee pay issue has annoyed Albertans since his organization brought it to their attention earlier this month. "It's the fact that they shouldn't have got it in the first place that really gnawed at people and they wanted their money back," he said. "And they're going to get it and that's good." Redford also announced that she is suspending transitional allowances for MLAs leaving politics. The hefty payments that all legislature members receive when they leave office have been a troublesome issue for Redford's Tories. It's been a sore point again in the campaign for the April 23 election because departing politicians are getting a total of more than $10 million — including more than $1 million alone for Speaker Ken Kowalski. They will not be affected by Redford's decision.